Several months ago, I wrote a blog post about my struggles with social anxiety. I’d like to say things have improved remarkably for me in that area since then … but that would be a lie. If I had to say whether I struggle more with depression or social anxiety, I’d say the latter would be winning hands down these days. Some limited assertiveness training helped me out a little, but I’m still just as likely to duck down a side alley as I am to say hello to an acquaintance on the street. Social anxiety can, obviously, carry a lot of unintended consequences with it. You can hurt yourself career-wise (which I might be doing by even writing this). You can isolate yourself from friends. You can even cause strain within your own family. For me, though, one of the main side effects has consisted of crushing, unrelenting guilt. Trying to determine whether the social anxiety exacerbates the guilt from my chronic depression or whether my chronic depression is a result of the guilt caused by the social anxiety is like trying to determine if the chicken or the egg came first. 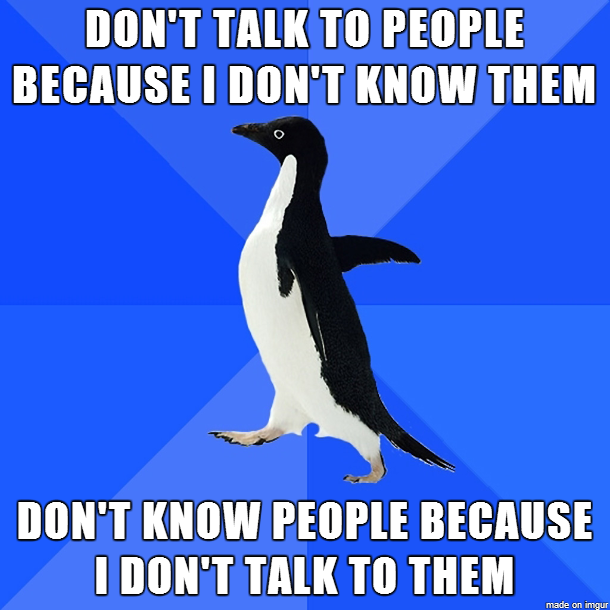 Primarily, my guilt from social anxiety stems from not being able to talk to people. More specifically, I have difficulty initiating conversations. At least, that’s how I perceive things most of the time. If I see someone across the grocery store from me and I don’t walk over and say something to them, that’s my fault. I didn’t have the courage to make contact. I generally assume everyone else in the world is perfectly socially adjusted; I’m the one with the problem. This weekend, though, a thought occurred to me that honestly had never entered my mind in my 40 years of life on this earth. I was walking through the local Walmart when I saw someone coming toward me who I sort of knew, but wasn’t exactly sure they would remember me. Whether through my personality or average looks or some other factor, people have a tendency to forget who I am, so most times in these situations low self-esteem takes over and I just assume they don’t. We exchanged a brief glance and passed without saying anything to each other. I generally tend to roll scenarios such as this one over and over in my mind for quite some time, so it was literally hours later before I realized this person actually looked at me, too. And that’s when it hit me: He may have actually known who I was. Why is this important, you may ask? Well, in my mind at least, it suddenly opened up the possibility that I might not have been totally at fault for this missed encounter. And then the floodgates really opened as I began to remember all the times I knew people who did recognize me saw me in public and didn’t take the initiative to speak. Could this mean that other people chicken out sometimes, too? Could it be that it’s not always entirely my fault? I have no doubt I have hurt at least one person’s feelings over the years by not speaking to them somewhere, and I also know I’ve missed out on a lot of opportunities because of fear. To be honest, it’s downright embarrassing. To have a thought like the one I had this weekend, though, at least removes a little of the guilt. I still may not be the best conversationalist in the world, but I can at least consider that maybe there’s something more at play than just my own shortcomings. Communication is, after all, a two-way street. So if for some reason I pass you by at the mall one day, please don’t be too upset with me. I’m trying the best I can to do better. On the flip side, if you don’t say hello to me I’ll try to remember you’re doing the best you can, too.